For the past 17 years, the Office Depot Foundation has donated more than 4 million sack packs to children around the world as part of its National Backpack Program. 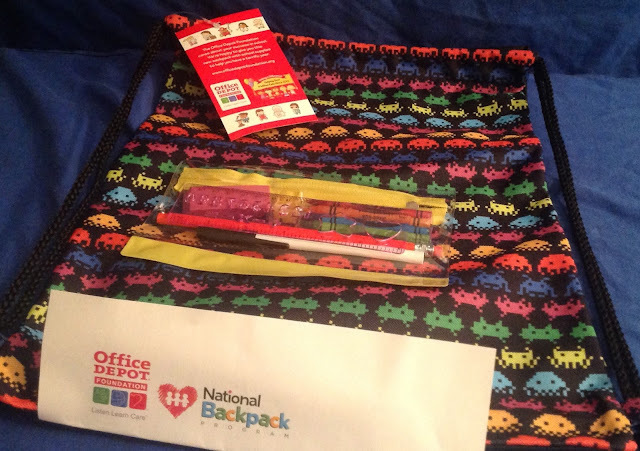 This summer, the Foundation, which is the independent charitable giving arm of Office Depot, Inc., will be donating 100,000 colorful new sackpacks to nonprofit organizations, schools and agencies across the United States and internationally. This year, in addition to donating sack packs to children who need them most, the Foundation is highlighting the importance of STEM and STEAM (science, technology, engineering, arts and math) programs in our nation’s schools. To encourage kids to explore these important curriculums, the Foundation has partnered with Captain Vernice “FlyGirl” Armour, America’s first African American female combat pilot, who will make special guest appearances at the Foundation’s Back-To-School celebrations in Los Angeles and Chicago. Thousands more sack packs are being given to kids through the Office Depot Foundation’s continuing partnerships with a number of nonprofit organizations serving children nationally and globally. The Foundation is collaborating with Food For The Poor, Feed the Children, the National Court Appointed Special Advocates (CASA) Association, the National Foundation for Women Legislators and the AARP Foundation. The specially designed, drawstring-style sack packs come in seven bright and fun colors. Each one includes a zippered pouch containing a pen, pencil, pencil sharpener, eraser, six-inch ruler and four crayons. Thanks for sharing the informative post. Will try to join.